I recently had a conversation with a fellow student from Korea who also lives in my dormitory. We were talking about our family names and what they actually mean. He explained to me, that his family name “Jhi” is rather uncommon in Korea. I would like to tell the story behind his family name. Korean names can be transcribed in various ways. The most convenient possibility is by using roman letters. There are however several transcription systems for Korean. Consequently the meaning and origin can get lost very quickly. The most common way in Korea is by using Hangul. But Hangul is also a typeset based on phonetics and so a name can have many homonyms. In order to avoid possible confusions with homonyms the Korean also reflect their names with the pictographic Hanja. The name “Jhi” is in Hangul “지” and in Hanja “池” (note that in this case there is also a homophone name with a different Hanja: 智). The phonetic name “지” (Jhi) is registered in Korea with less than 150 000 persons which is approximately 0,003 % of the Korean population, which shows that it is already quite rare on a phonetic level. The Hanja name is even rarer and it can reveal the family name’s origin. The most common family names in South Korea. Edited from Wikipedia. The story leads us back around the year 903 to the Silla Kingdom (新羅 – 신라). At the same time ancient China was ruled by the Táng Dynasty (唐朝). During these times Silla dominated the maritime trade in the Yellow Sea (黃海 – 황해). In order to enable better trading conditions, Táng sent Mandarins (官) to Silla. These Mandarins operated in the trading town Chungju (忠州 – 충주), which Hanja can be translated to “loyal to the state”. The Chinese officials handled the official relations between Silla and Táng and among these was one high bureaucrat named “Chí Jìng” (池鏡). As the history continues, the Tang realm fell apart into smaller kingdoms and on the Korean peninsula the political situation also changed. 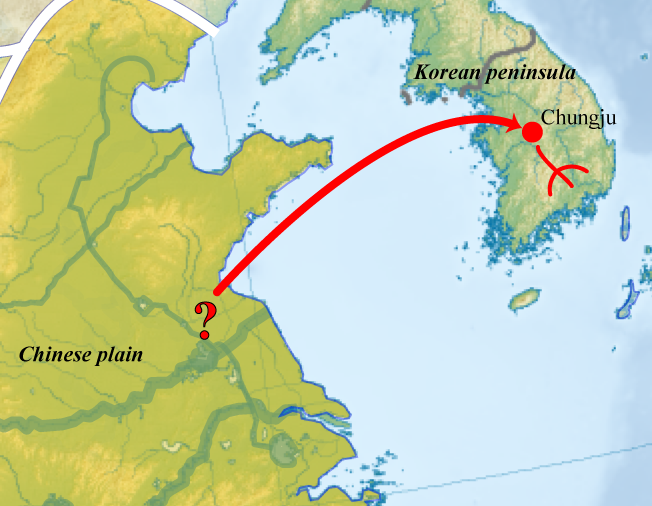 The Kingdom Baekje (百濟 – 백제) was conquered by Goryeo (高麗 – 고려) and later Silla as well. Thus Goryeo became the dominating realm on the Korean Peninsula in 918. The trading however persisted. Goryeo‘s war was supported by China and implemented their the civil service examination system, which they called “Gwageo” (科擧 – 과거 ). In 960 the Song Dynasty (宋朝) ruled over China and they decided to tighten the relations to Goryeo. In the very same year the Chí family had the direct authority from the Chinese emperor and consequently was the most powerful Chinese family in Goryeo. In this year they also decided to settle down in Chungju. With the new home the Chí also took a new name, the first recorded name is: 忠州池氏 – 충주지씨 – Chungju Jissi. Additions like “忠州” were common in order to indicate the family’s hometown. Estimated migration path of Jhi. Edited from Wikipedia. From 1392 when Goryeo became Joseon (朝鮮 – 조선) the Jhi (池) family name slowly spread down south to Gyeongnam Ji (경남 지). And within the centuries the family status slowly declined from the highest ranking to a medium rank. And it became eventually quiet around them. The family name never spread widely among Korea for two reasons. First of all the Korean society always tried to keep distance from immigrants. And the Hanja-name indicated its origin quite obviously. Additionally in the centuries before 1000 poor Chinese immigrants came to Korea and had a slave-like status. These people were called Cheonbangjichugmagolpi (천방지축마골피). This long-term derives from their seven family names (天, 方, 地, 丑, 馬, 骨, 皮). These names persisted within Korea, but always kept their bad connotation. And the “bad” name Ji (地 – 지) is homophone with the high rank name Jhi (池) and shares also the radical “也”. During the 19th century, the economy in Korea had changed and the members from the lower castes became wealthier. In 1894 the Gabo Reform (甲午改革 – 갑오개혁) abolished the feudal caste system in Korea (Hanja became also less significant and Hangul was used more often). The Lower caste people wanted to get rid of their bad family names and bought themselves names with higher reputations, such as Kim (킴), Lee (이) and Park (박). Jhi (지) however remained unpopular and kept its uniqueness. A lot of Korean history can be told by just looking at one particular Hanja-name. Even though the family has completely been assimilated, the name’s origin never changed within more than 1000 years of history and is a proof of early migration in Korea. Immigration based on trade happened very frequently in the Asia-Pacific region and shows that many societies in Asia are not as homogeneous as they often consider themselves to be. More stories can be found in trading ports of Vietnam or in western China for instance. Some questions are still unanswered. For example: From which part of China did the 池 originate? Thanks go to Jhi Sangho, who told me his story and helped me figuring out the details! Chaffee, J. (2010). Song China and the multi-state and commercial world of East Asia. In: Crossroads – Studies on the History of Exchange Relations in the East Asian World. Vol 1/2. Germany: Ostasien Verlag. Retrieved from: http://www.eacrh.net/ojs/index.php/crossroads/article/view/4/Vol1_Chaffee_html. Chungju City. (2011). Chung-ju history. Retrieved from http://www.cj100.net/english/?menu=Introduction/Chung-ju History. Ji, R. K. (2012). 성씨의 고향 모든지씨 인물 [Blog Post]. 아름다운 세상 속으로. Retrieved from http://blog.daum.net/asqw1222/70. The Academy of Korean Studies. (n.d.). 충주지씨(忠州池氏). Retrieved from http://people.aks.ac.kr/front/tabCon/lst/lstView.aks?lstId=LST_209_618_0519&choiceGanada=자&choiceOrderNum=101|180&classCode=MN&isEQ=true&kristalSearchArea=P. 지정덕. (n.d.). 忠州池氏의 故鄕. Retrieved from http://www.bakho4u.com/Genealogy/SungSsiKohyang.htm. 김중태. (2004). [한글018] ‘천방지축마골피’에 대한 잘못된 속설 [Blog Post]. IT문화원. Retrieved from http://www.dal.kr/blog/archives/000615.html. Wow. I always felt that Koreans rarely used Chinese characters so this is really interesting!I am surprised that such a long history of the surname has been kept, but also admire it. Chinese characters can reveal so much history about lifestyles and people, because essentially, they’re pictures. Furthermore, because they’re spread throughout major Asian countries, different historical perspectives could be understood. Wait, so does this mean Sangho is descended from Chinese officials??? But: It could be that one of his ancestors bought the name during the Gabo Reforms. The problem is, that I can not access their family record and it is also in Korean. But the chances are very high, that he is a descendant, given the fact, that “Jhi” is not a very popular name in Korea. Nevertheless it proves that Korea isn’t as homogeneous as many people believe and immigration has happened throughout history. I didn’t even know Korea used to have a caste system. It is kind of sad, they got rid of thier name even though it has bad connotation. your blog made me that I went to google in order to search Japanese case. As far as I found, there are still some indication of caste system(discrimination of name as well) such as Braku problem, and heredity problem. I decided to write about this for this blog. I realized the name should has connotation, and it relate to history, culuture, back ground so on. it was very interesting blog post and i enjoyed reading it. it is surprising that over 20% of the korean people have the family name of Kim(金). I studied about Japan-Korea relations and have participated Japan-Korea student peace conference for 3times. so your article was interesting to me and i will share some stories about Korean name in Japan. You may know about this, but there are many korean people live in Osaka. They are called 在日韓国人(Zainichi kankokujin) and many of them live in Tsuruhashi area which is located in central part of Osaka. i live near there, so in my elementary school, there were some korean friends. One of my close korean friend name was Park(朴) and i assume his family used their korean name in Japan since his family name was 朴. However, many of 在日韓国人 did not used their korean name for long time because of the discrimination. i know many 在日韓国人 who use Japanese names and these are mostly like 金本、金田、金山、金沢、大原、朝田. you can tell that they created the name that is related to the famous korean name Kim(金). But if they do that, Japanese can tell that they are from Korea and people often discriminated them. This is one sad story of the Korean name in Japan. but the situation is getting better now compare to some decades ago. Since around the world cup which held in both South korea and japan, people started to try to know each other and each other’s culture. well, i may write some post about korea- japan relations! Intresting point, telling a story by tracking the heritage of the name! I believe that’s an interesting method studying most countries.